NEW BLUE JOE COLOMBO MODERN BOBY (COLOR: BLUE) - Stardust has released Joe Colombo's Boby Trolley in a beautiful new electric blue color. Organize your desk with this versatile storage container on casters. For business and home office. 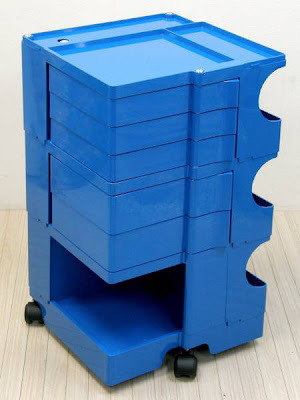 Unclutter, simplify and organize your desk top and your office environment with this extremely versatile mobile storage container on casters. This handy organizer will be a functional everyday organizing tool. It will free-up space so you can concentrate on getting some actual work done! With a height of 29.25" it tucks neatly under most tables or next to your office desk. Several trays are the perfect size to store your paper, envelopes, stamps, paperclips, pens, calculator, invoices, bills, etc. The side panels can be removed to store posters & tubes. 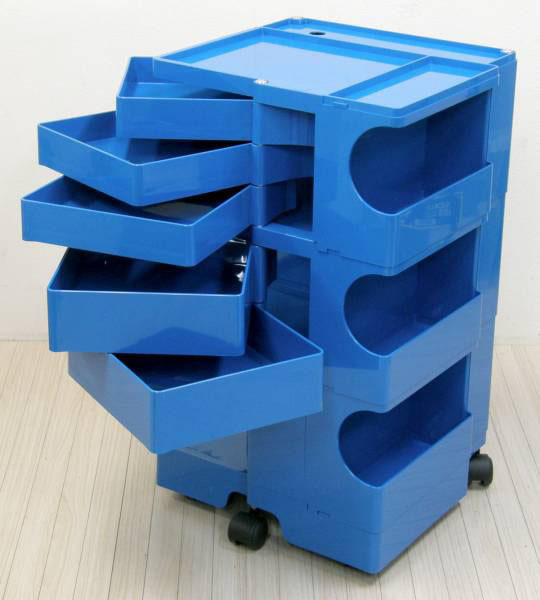 Because of its organizing capabilities, it is a perfect office organizer for architects, designers or artists. Sturdy as well, this is made of superior grade plastic which is almost indestructible. This wonderful piece of furniture is must-have for both home- and office environments. Select from several color choices.